During my tech days, I co-authored four software patents. Each cost my startup about $15,000—which seemed like a fortune in those days. I didn’t really expect these to give me any advantage; after all if my competitors had half a brain, they would simply learn all they could from my patent filing and do things better. But I needed to raise financing, and VCs wouldn’t give me the time of day unless I could tell a convincing story about how we, alone, owned the intellectual property for our secret sauce. We got the financing, and the plaques of the patents looked great in our reception area, so the expense was worth it. But there was definitely no competitive advantage. Patents make a lot of sense in many industries; they are needed to protect the designs of industrial equipment, pharmaceutical formulations, biotechnology products and methods, biomedical devices, consumer products (toothpaste, shampoo, contact lenses, etc. ), advanced materials & composites, and of course, widgets (lighting fixtures & elements, batteries, toys, tools, etc.). But in software these are just nuclear weapons in an arms race. They don’t foster innovation, they inhibit it. That’s because things change rapidly in this industry. Speed and technological obsolescence are the only protections that matter. Fledgling startups have to worry more about some big player or patent troll pulling out a big gun and bankrupting them with a frivolous lawsuit than they do about someone stealing their ideas. In software, only 24% of startups even bothered to file a patent. In medical devices, this proportion was 76%; and in biotech, 75%. Far more venture-backed companies file patents: in software, 67%; in medical devices, 94%; and in biotech, 97%. Venture-backed companies also file more patents than others that file patents. They file, on average, 5.9 patents as against the all-company average of 1.7. In medical devices and biotech, this is 25.2 vs. 15.0 and 34.6 vs. 9.7, respectively. 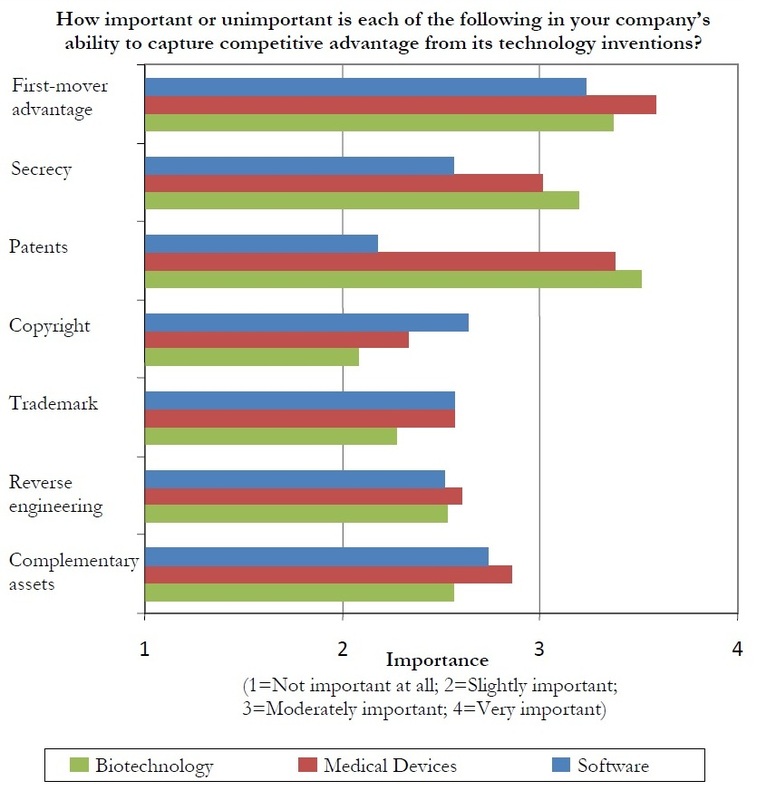 Software executives consider patents to be the least important factor for competitiveness. They perceive gaining first-mover advantage to be the most important factor, followed by acquisition of complementary assets; copyrights; trademarks; secrecy; and making software difficult to reverse-engineer. Companies file patents to prevent competitors from copying their products, to improve their chances of securing an investment or liquidity event (IPO, acquisition, etc. ), improving the company’s reputation, and to gain bargaining power against others. Surprisingly, companies that held patents—even venture backed—didn’t believe that patents made them more likely to innovate. Even more surprising, a quarter of companies that licensed technology from others said they did this to avoid lawsuits—not to gain technology or knowledge. 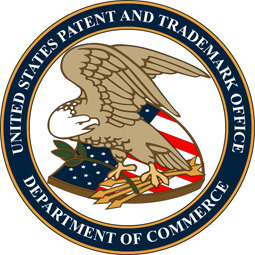 In other words, the patent constituted a weapon or a trophy rather than a way to obtain revenues from others’ commercial adoption of their technology. Pam Samuelson, one of the co-authors of the report, says that her conclusion from the research is that the world may be better off without software patents; that the biggest beneficiaries of software patents are patent lawyers and patent trolls, not entrepreneurs. Meanwhile, the U.S. patent system is clogged and dysfunctional. John Schmid, of the Milwaukee Journal Sentinel, analyzed U.S. Patent and Trademark Office data and found that as of 2009, there were more than 1.2 million patents awaiting approval—nearly triple the number a decade earlier. In 2009, the patent agency took an average 3.5 years to deal with a patent request—more than twice the 18-month target. What is most alarming is that the patent office automatically publishes applications on line after the 18 months—outlining each innovation in detail regardless of whether an examiner has begun considering the application. Competitors anywhere in the world can steal ideas. This effectively undermines the entire purpose of the patent system: the patent office is charging applicants serious money for giving it the privilege of giving away their commercial secrets. To make matters worse, the patent office is rejecting applications at an unprecedented pace—with fewer than 50% being approved, compared to 70% a decade ago. One estimate is that this costs entrepreneurs at least $6.4 billion each year in “forgone innovation”: legitimate technologies that cannot get licensed and start-ups that cannot get funded. So the agency charged with protecting U.S. intellectual property and aiding innovation is often doing the exact opposite. Brad Feld, managing director at Foundry Group, says that we should simply abolish software patents. He believes that the system has spun completely out of control, with the vast majority of filings not passing the fundamental tests of a patent (that it be non-obvious, novel, and unique innovation). Copyright and trade secrets have historically been the primary protection mechanisms for software intellectual property, and they are still the best solutions. Feld notes that technology companies are now forced to divert huge resources to defend themselves from patent trolls rather than advance their innovations. The founders of the United States considered intellectual property worthy of a special place in the Constitution—“To promote the Progress of Science and useful Arts, by securing for limited Times to Authors and Inventors the exclusive Right to their respective Writings and Discoveries.” They had the concept right, but they surely never conceived of Amazon.com patenting clicks in an online shopping cart and methods for having an online discussion, or Microsoft patenting methods for activating double click applications with a single click. It’s time to do as Brad Feld suggests: simply abolish these abominations. Editor’s note: Guest writer Vivek Wadhwa is an entrepreneur turned academic. He is a Visiting Scholar at the School of Information at UC-Berkeley, Senior Research Associate at Harvard Law School and Director of Research at the Center for Entrepreneurship and Research Commercialization at Duke University. You can follow him on Twitter at @vwadhwa and find his research at www.wadhwa.com .